The eyes are funny things, and the smallest trick can completely pull the wool over them and have you questioning everything you 've ever known - or thought you knew. Now a new mind-boggling trick has us pulling our hair out! What appears to be a bunch of circular cylinders, somehow (as if by magic) appears as rectangular cylinders when put against their reflection in the mirror. This genius invention is the 'ambiguous cylinders' illusion, the creation of Kokichi Sugihar, a professor of engineering at Meiji University in Japan. 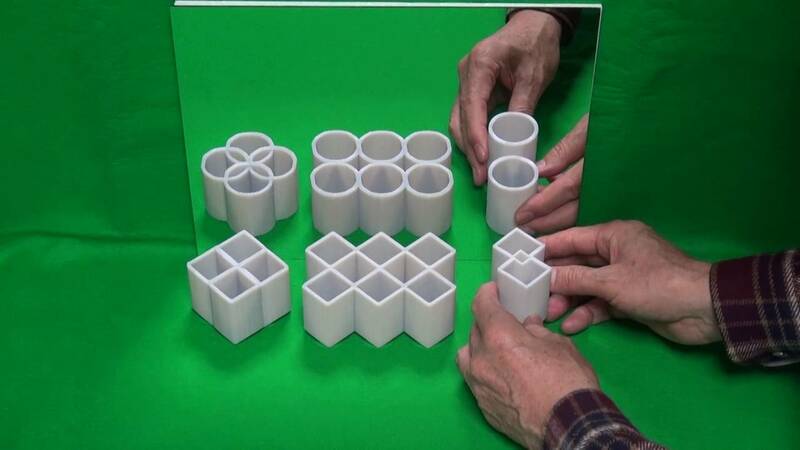 Read more: Can Your Brain Handle This Ultimate Optical Illusion Test? Its thought that the mysterious cylinders rely on the viewer looking at a structure from a certain angle along with the help of some strategically placed folds that look like curves when seen back to front. It's no surprise that Sugihar's illusion came first runner-up in the Best Illusion of the Year contest, a community-run competition that aims to remind us that "all perception is illusory to some extent." Well, its safe to say they've done that successfully!